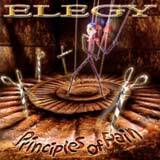 Elegy have returned with the new opus Principles of Pain, and I am quite pleased to say the least. This is an album that sees the band fuse influences from prog, power, speed metal, and of course killer melodies to create one hell of an offering. Throw in emotional and melodic vocals of Ian Perry (he reminds me of a cross between Ronnie James Dio and Heavens Gate's vocalist) and the result is fantastic. The guitar work on this album keeps me smiling from beginning to end. Killer riffs mixed with some nice grooves and well placed (and technically challenging) solos will demand several listens to be fully absorbed. The music on this album is more technical than most of Elegy's previous work and I find it to be an album that really requires my full attention to fully appreciate. Again, the fusion of power, speed, and prog works very well for the band as it keeps the songs unpredictable. However, most of the faster songs are placed on the first half of the album with the song structures expanding and becoming more focused on the progressive side of things during the latter half of the album. I might have preferred one or two more speedy tracks during the second half of the album. However, there are no weak tracks on the album to speak of, so this is a minor complaint. The melodic quality of the songs is maintained throughout and the musicianship is absolutely top notch. Two thumbs up to the guys for the production on this album. The instruments mesh together perfectly at just the right level and Ian's voice is as crystal clear as could be. Poor production can often hide the true talents of a band, but in this case the production serves to emphasize the talents of the band and allows the songs to song the best that they possibly can. Fans of melodic metal who like a good deal of diversity on an album should jump all over this album. Prog, Speed, and Power metal are all visited by Elegy. With the emotional vocals of Ian Perry and the technical abilities of the musicians behind him, you can't go wrong with Principles of Pain.